The American Resort Development Association of Hawaii (ARDA-Hawaii) has named Julie Pavao, Executive Assistant at The Westin Princeville Ocean Resort Villas, as its Kauai "Timeshare with Aloha" awardee. (L-R) Lynn McCrory, Julie Pavao, Denise Wardlow, Christina Gabriel. The American Resort Development Association of Hawaii (ARDA-Hawaii) has named Julie Pavao, Executive Assistant at The Westin Princeville Ocean Resort Villas, as its Kauai “Timeshare with Aloha” awardee. 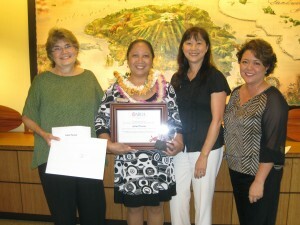 Pavao is the first to receive Kauai’s 2012 Timeshare Employee of the Year award through the statewide program that works to recognize those in the hospitality industry that go beyond the call of duty. 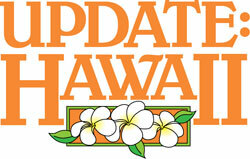 ARDA-Hawaii established the “Timeshare with Aloha” Awards this year to showcase and reward committed industry professionals who make Hawaii a special place to visit. One outstanding employee from Kauai, Oahu, Maui, and Hawaii were recognized and received a two-night stay at a Hawaii timeshare resort and $1,000 to spend during their vacation. Pavao has been with Starwood Vacation Ownership since 1987. According to her nominator, Denise Wardlow, General Manager at The Westin Princeville Ocean Resort Villas, Pavao is one of the main reasons why associates describe working at the resort as being part of an extended ohana. To her staff and guests, she is known as “Aunty Julie” and she is always willing to listen and help whenever she can. She also embodies the Aloha Spirit as evidenced through her strong work ethic and her ability to ensure that guests’ needs are being met. Pavao enjoys being active in the community and in addition to her participation in organizing the Visitor Industry Charity Walk on Kauai, she has also participated in the Relay For Life, Adopt-A-Highway, the Westin Princeville Charity Golf Tournament and the resort’s Silent Auction for the Kauai Lifeguards Association.